Camellias - So much more than a good "cupa"! We have a category in our plant database where we enter the uses for a particular plant species - there was only one word to put under Camellias and that was Versatile. In our opinion there is no other evergreen shrub that will reward the gardener as much as the undemanding yet top performing Camellia. There are definite cultural requirements to guarantee top performance, however Camellias are remarkably tolerant and adaptable. They are invaluable for hedging, screening, background planting, container planting and as one-off stunning specimens. They trim well, transplant easily, and can provide flowers from as early as March through to November. Many have a delicate fragrance - especially species Camellias. When choosing a Camellia be aware that the word miniature usually describes the leaf and flower size rather than the size of the plant. However no need to worry about size really as on average most Camellias only grow to aproximately 2m. If you want your plant to stay under 2m then just give it a trim immediately after flowering. The flower colour ranges from white to pink and red with many wondrous variations on this theme. Flowers can be exquisitely simple and single to full, frilly, blowsy numbers. Whatever tickles your fancy. Camellias are hapiest in what is described as acid soil. This usually means soil that does not have too much clay content. They like a nice peaty soil that drains well. You can work some peat into your soil if you feel it has a bit too much clay. The roots are fibrous (this means they dont have a long tap root) and near the surface so it is important to keep them cool in the heat of summer with a layer of mulch such as bark or compost. If at all possible plant with protection from the afternoon sun. You can buy a specialized acid fertilizer to feed your Camellias which will assist them to stay healthy and keep the foliage the deep glossy green that we all love. Fertilizing is usually done in early autumn. Warning: remember when aplying fertilizer, less is always better than more i.e. follow the instructions. If you are looking for early autumn flowering species, then as a general rule choose C. sasanqua (sa-sang-kwa) as they are usually the first to flower in March followed by C. japonica and C. reticulata. Camellia hybrids, and there are thousands of them, generally flower from May through to October. All are evergreen i.e. keep their leaves all year round. If you are feeling a bit tired from thinking about all this gardening put your feet up and make a nice cupa knowing that it has been brewed from the leaves of the lovely Camellia sinensis. Camellias, good for your body, good for your soul. Hybrid. A lovely little Camellia with formal, bright pink, double flowers. It certainly is adorable and worth finding a spot for. Happiest with morning sun or part shade and acid soil. Flowers in late winter early spring. Evergreen. Current Stock Height: 90/100cm ? Hybrid. Clusters of tight buds open to reveal tiny, blush pink, single flowers which adorn this delightful little Camellia from late winter to spring. Prefers a semi-shaded position and acid soil. Will do well in a container. Evergreen. Current Stock Height: 80/100 cm ? Current Stock Height: 120/130cm ? Japonica. Exquisite formal double blooms toned blush pink faintly edged with a deeper shade of pink. Flowers from winter through to spring. Nice upright Camellia. Plant in a semi-shaded position in acid soil for best results. Evergreen. Hybrid. This Jury hybrid from NZ has an Award of Garden Merit from the Royal Horticultural Society. It is a real show off with large double blooms of bright rose pink. Good strong grower with large glossy green leaves. Happiest in morning sun or part shade and acid soil. Evergreen. Current Stock Height: 70/80cm ? Hybrid. A Camellia with a difference as the large informal, double flowers are rose pink and white. Quite striking against the green foliage. Flowers from July through to September. A Jury hybrid bred in NZ. Happiest in morning sun or semi-shade. Evergreen. Current Stock Height: 55/65cm ? Sasanqua. A simple, sweet, easy to grow Camellia that is ideal for screens and hedging. The flowers are single and white with a strong blush of pink. Flowers from early autumn onwards. Nice dark green foliage that clips well. Plant in semi-shade with acid soil for best results. Evergreen. Current Stock Height: 130/150cm ? Hybrid. Strong growing bushy shrub with mid-green small long leaves on layered graceful arching branchlets. Through spring the bush is profusely covered with tiny, single white flowers. Lovely as a dainty specimen or hedge. Evergreen. Current Stock Height: 90/110cm ? Japonica. Very pretty, soft, silvery porcelain pink, formal blooms appear from early winter through to early spring. Picks well. Happiest in part shade and acid soil so avoid lime. Evergreen. Current Stock Height: 80/100cm ? Hybrid Miniature. If you want a really cute little Camellia to grow in a container or a hanging basket then it would be hard to go past 'Baby Bear'. The tiny semi-double flowers are pale pink blushed white and combine well with the dainty foliage. Flowers from July to September. Slow growing. Evergreen. This is a delightful compact Camellia with small formal double flowers that are white blushed with pink. Very pretty. Would make an excellent container plant. Japonica, evergreen. Happiest in morning sun or semi-shaded position. Sasanqua. A very pretty Camellia with dainty double white blooms that are shaded softly with mauve pink on the edges. These are produced en masse in autumn and early winter. Small dense bright green foliage. Happiest in semi-shade with acid soil. Evergreen. Current Stock Height: 100/120cm ? Hybrid. A very formal looking Camellia with dark red, large, double blooms. The petals have a silvery sheen with a small narrow black edge. Quite special. Happiest in morning sun or semi-shade and acid soil. Evergreen. Current Stock Height: 50/70cm ? Hybrid. Once in bloom this delicious Camellia will definitely have you in its 'Black Magic' spell. The semi-double blooms of black-red are stunning! Fast growing with an open spreading habit and attractively serrated foliage. Happiest in morning sun or semi-shade and acid soil. Evergreen. Japonica. An oldie but a goody. Beautiful, formal, double blooms of deepest red make this a highly desirable Camellia. Flowers late winter to spring, quite a compact shrubby habit. Happiest in semi-shade and acid soil. Evergreen. Japonica. An oldie but a goody. Beautiful, formal, double blooms of deepest red make this a highly desirable Camellia. Flowers late winter to spring, quite a compact shrubby habit. Happiest in semi-shade. Presented here as a Standard. Evergreen. Current Stock Height: STD-90/130 cm ? Japonica. Like it's name-sake 'Bob Hope' is a real star. Large showy, deep red, semi-double blooms are highlighted with bright yellow stamens. Lustrous dark green foliage. Flowers July to September. Happiest in semi-shade and acid soil. Evergreen. Current Stock Height: 30/40cm ? Species. Delicate, tiny, star shaped, single, pure white flowers with yellow stamens are borne in profusion on a shrub with attractive small oval dark green leaves. Nice light scent. One for the collector or, if like me, you like sweet simplicity. Happiest in semi-shade and acid soil. Evergreen. Current Stock Height: 80/110cm ? Species Std. Delicate, tiny, star shaped, single, pure white flowers with yellow stamens are borne in profusion on a shrub with small oval dark green leaves. Nice light scent. One for the collector or, if like me, you like sweet simplicity. Happiest in semi-shade and acid soil. Evergreen. Current Stock Height: STD-90/HGT130cm ? Japonica. The antique white outer petals gracefully surround the ruffled inner petals of light, creamy primrose yellow. Neat and tidy growth habit and very eye catching. Happiest in semi-shade where the flowers won't 'burn' in the sun. Evergreen. Hybrid. This is a really lovely little Camellia with perfectly shaped, formal double flowers. The outer petals are a deep pink shading to almost white on the inner petals. These are attractively curved and fluted. A strong compact grower. Perfect for a pot. Plant in semi-shade. Evergreen. Hiemalis. A very pretty Camellia with large, formal, double, brilliant pink blooms with ruffled petals. These are produced en masse in autumn and early winter. Small dense bright green foliage and an upright 'willowy' habit. Happiest in semi-shade. Evergreen. Hybrid. This is a delightful little Camellia with semi-double flowers that are white with pink tinges on the petal edges and backs. In full bloom the overall effect is very soft and pretty. An added bonus of fragrance makes this a definite must have. Strong upright growth habit. Evergreen. Current Stock Height: 120/140 cm ? Hybrid Esp. This is a delightful little Camellia with semi-double flowers that are white with pink tinges on the petal edges and backs. In full bloom the overall effect is very soft and pretty. An added bonus of fragrance makes this a definite must have. Strong upright growth habit. Evergreen. Current Stock Height: 90/90-120 cm ? Hybrid Std. This is a delightful little Camellia with semi-double flowers that are white with pink tinges on the petal edges and backs. In full bloom the overall effect is very soft and pretty. An added bonus of fragrance makes this a definite must have. Strong upright growth habit. Evergreen. Reticulata. The NZ breeders of this simply beautiful Camellia certainly deserve our congratulations. Pale orchid-pink, formal flowers with unique wavy petals that are thick and textured dress the bush from mid winter through to mid spring. Self grooming. Evergreen. PVR. Current Stock Height: 100/110cm ? Japonica hybrid. Mid season. The purest white, very large semi-double flowers with beautiful central crown of ruffled and crimped petaloids and golden stamens. Vigorous. Japonica. Here's something a bit different - a Camellia with twisted, undulating stems and leaves. The leaves which are a glossy dark green are complemented by large semi-double red blooms in spring. Something of interest all year round. Happiest in acid soil and dappled light. Evergreen. Japonica. This Camellia really is a cause for celebration. Beautiful creamy yellow blooms that are fully double and made up of more than 100 petals really stand out against the dark glossy green foliage. Slow compact growth habit. Just lovely. Plant in semi-shade. Evergreen. Current Stock Height: 70/80 cm ? Japonica. Delicious, full and frilly flowers of warm maroon (reddish purple) are complemented by the lustrous deep green pointed foliage. Strong upright growth habit. Happiest in semi-shade. Evergreen. Hybrid. A free flowering Camellia with medium sized, fully double,clear rosy-pink blooms. A strong vigorous upright growth habit. Quite stunning in full bloom. . Happiest semi-shade and acid soil. Bred by Les Jury of NZ. Evergreen. Japonica. The ivory white blooms are delicately blushed with pink and create a simply beautiful picture when this Camellia is in full bloom. Definitely desirable. Nice glossy green healthy foliage. Happiest in semi-shade and acid soil. Evergreen. For those who desire a dark red Camellia, this is the plant for you. Very dark , almost black buds open to very dark red flowers. Long flowering and vigorous upright growth habit. Japonica, evergreen. Happiest in morning sun or semi-shade. Current Stock Height: 90/100 cm ? Japonica. An attractive Camellia with sumptuous, medium sized blooms that are bright coral pink initially and gradually fade to violet as they age. Strong glossy green foliage. Happiest in morning sun or semi-shade. Evergreen. Current Stock Height: 120/140cm ? Hybrid. Semi-double pink blooms attractively veined and shaded with rosy pink. An abundance of flowers appear over a long period from winter through to the end of spring. Used as a special gift by the N.Z.Organ Donor organization for donor families. Happiest in semi-shade and acid soil. Evergreen. Current Stock Height: 70/90cm ? Reticulata. Bold, bright and beautiful. Large, semi-double scarlet blooms that will brighten up any garden through dull winter months. Attractive large serrated green foliage. Very hardy and vigorous. Plant in a semi-shaded position for best results. Evergreen. Multi Award Winner. Current Stock Height: 40/70 cm ? Hybrid. This is a stunning Camellia bred in NZ by the master, Felix Jury. Beautiful bright pink, formal double blooms with a hint of lavender start appearing in mid winter. The petals are curved seductively. A delightful addition to any garden. Evergreen. Current Stock Height: 50/90 cm ? Hybrid. For those of you who like formal blooms then this Camellia is one of the best. The warm pink formal, double blooms appear from around July through to September. Has a columnar growth habit. Plant in semi-shade in acid soil for best results. Evergreen. This Camellia was bred and named for Australian scholar, linguist, garden designer and camellia expert the late Eben Gowrie Waterhouse who amongst many achievements in his life was a long standing and enthusiastic member of the International Camellia Society. Sasanqua. A top performing Camellia that flowers from early autumn through to early winter. The blooms are double white, with just a hint of blush pink on the outer edges. Upright vigorous habit. Happiest in semi-shade. Evergreen. Current Stock Height: 100/120 cm ? New stock arriving shortly. Pre-order now. Estimated price $27.99 each. Payment when stock arrives. Current Stock Height: 100/130cm ? Sasanqua. A very good performing Camellia that flowers from early autumn through to early winter. The blooms are double, white, with just a hint of blush pink on the outer edges. Upright vigorous habit. Happiest in semi-shade. Presented here espaliered. Evergreen. Sasanqua. A very good performing Camellia that flowers from early autumn through to early winter. The blooms are double, white, with just a hint of blush pink on the outer edges. Upright vigorous habit. Happiest in semi-shade. Presented here as a standard. Evergreen. Large semi-double chalky white heavily textured blooms stand out against the dark glossy green foliage. A Camellia with the wow factor. Good strong grower flowering from July through to early spring. Happiest in morning sun or part shade. Japonica. Evergreen. Current Stock Height: 90/110 cm ? This is a stunning Camellia with very large creamy white blooms that are semi-double. The centre of the flower looks like whipped cream offset by soft wavy outer petals. Attractive serrated foliage. Happiest in morning sun or semi-shade. Japonica, evergreen. Sasanqua. This Camellia is well named as the single, white washed with pink blooms are truly exquisite. Golden stamens complete the picture. Lovely dark green foliage and a soft perfume to delight the senses. Happiest in semi shade and acid soil. Evergreen. Hybrid. This beautiful Camellia has tight bright pink buds that open to miniature, single, apple-blossom pink blooms which are lightly fragrant. A pretty Camellia which would suit a small courtyard or patio area. Flowers for a long period. Happiest in semi-shade with acid soil. Evergreen. Current Stock Height: 110/130cm ? Current Stock Height: 70/100 cm ? Hybrid Espalier. This beautiful Camellia has tight bright pink buds that open to miniature, single, apple-blossom pink blooms which are lightly fragrant. A pretty Camellia which would suit a small courtyard or patio area. Flowers for a long period. Happiest in semi-shade with acid soil. Evergreen. Hybrid Std. This beautiful Camellia has tight bright pink buds that open to miniature, single, apple-blossom pink blooms which are lightly fragrant. A pretty Camellia which would suit a small courtyard or patio area. Flowers for a long period. Happiest in semi-shade with acid soil. Evergreen. Hybrid Miniature. Let 'Fairy Wand' sprinkle some magic in your winter garden. Small semi-double blooms of bright rosy red are produced en masse on this upright Camellia from early winter until spring. Lovely dark green foliage. Happiest in semi-shade. Bred in NZ by Mr Blumhardt. Evergreen. Hybrid. 'Festival of Lights' was bred in NZ and has an upright growth habit and dainty glossy green foliage. The 'lights' are miniature, single, pastel pink blooms adorning the shrub in winter-spring. Happiest planted in semi-shade with acid soil. Evergreen. PVR. Japonica. An exquisite looking, pure white Camellia with formal, double blooms that have finely fringed or serrated edges giving it quite a unique look. The dark green foliage complements well and the branches have a semi-pendulous habit. Special. Happiest in semi-shade with acid soil. Evergreen. The word fimbriate means "fringed' hence the name of this beautiful Camellia. Double White with blush undertones. Formal double. Medium size white flower, early to late season flowering. Medium size upright, bushy plant. Japonica. AKA Moshio - but no matter what you call this outstanding Camellia you will love the flame red semi-double blooms that have remarkable colour clarity. Attractive central zone of golden stamens. Vigorous upright growth habit. Happiest in morning sun or semi-shade. Evergreen. Hybrid. A delightful little Camellia that is smothered with small deep lavender pink blooms that are semi-double. Golden stamens add to the overall effect. The new spring growth is an attractive bronze shade gradually maturing to green. Upright growth habit. What a gay little bush! Evergreen. Current Stock Height: 110/120 cm ? Sasanqua. A top performing Camellia with, semi-double, white flowers that are heavily blushed with deep pink. Flowers from early autumn. Perfect for a quick growing hedge. Happiest in semi-shade but will tolerate some sun. Evergreen. Current Stock Height: 140/150cm ? Sasanqua. Semi double, frilly white flowers with cream anthers and pale pink outer edges. Subtle soft fragrance. Early autumn flowering. Very popular for hedging but equally attractive as a single specimen. Happiest in semi-shade. Evergreen. Current Stock Height: 60/70m ? Japonica. The showy rose-pink, semi-double blooms on this desirable Camellia will simply take your breath away. The petals of the flowers are quite waxy and have a gentle wavy effect. The prominent golden stamens complete the picture. Delicious. Evergreen. A beautiful camellia of double white fading to a creamy yellow centre. One of my Gran's favourites. Compact, bushy, upright, evergreen shrub, valued for luxuriant rich green foliage and anemone-form. Prefers sheltered site, sunny or shade, and any well drained neutral/acid soil. Japonica. Medium to large, double peony form flowers open to soft pink, then delicately fade to blush pink, and show beautifully serrated petal margins. Blooms early to mid season. Current Stock Height: 60/90cm ? Hybrid. Fabulously fragrant, pale-pink, fading to white, blooms that have a full and ruffled form. Vigorous growth habit. A lovely Camellia raised in NZ by Jim Finlay. Plant in semi-shade in a position to take advantage of the perfume. Evergreen. Current Stock Height: 70/100cm ? Hiemalis. Semi-double blooms of bright cerise with a slightly paler center appear in abundance throughout autumn. A shrub in full bloom simply glows with colour. Easy to grow. Happiest in semi-shade with acid soil. Evergreen. Current Stock Height: 100/125 cm ? Current Stock Height: 55/95 cm ? New stock arriving shortly. Pre-order now. Estimated price $15.99 each. Payment when stock arrives. Blooms are glossy salmon red, large and semi-double with distinctive creped petals. Medium compact upright growth with distinctive serrated foliage not unlike holly leaves hence the name. Happiest in morning sun or semi-shade. Japonica, evergreen. Hybid Miniature. This little sweetie was bred right here in NZ by Felix Jury. The softest pink flowers appear from mid winter onwards. Very dainty and pretty with the added bonus of a delightful fragrance. Useful for containers as slow growing. Happiest in semi-shade and acid soil. Evergreen. Current Stock Height: 25/30cm ? Sasanqua. An oldie but a goodie, this award winning Camellia has pretty double blooms of soft shell pink set against dark green foliage. Suitable for hedging or espalier work. Generous with bloom in autumn and easy to grow. Happiest in semi-shade with acid soil. Evergreen. Sasanqua. Soft warm pink semi-double to peony flowers, with wavy petals and dark green glossy foliage. Dense compact habit with vigorous upright growth. Excellent as a specimen plant and ideal for screens, hedging, large containers and espaliers. Early flowering in autumn and winter. Evergreen. Current Stock Height: 90/120 cm ? This newby has large, rose form blooms that are a deep pink with yellow stamens standing proud of the open flower. It has a medium, upright growth habit and is certainly worthy of a space in the planting scheme. Happiest with morning sun or part shade. Hybrid. Evergreen. Hybrid. The deliciously creamy flowers of this Camellia look good enough to eat with your pudding! Vigorous and profuse flowering from early autumn through to spring. Very showy, and well worth planting. Happiest in semi-shade with acid soil. Evergreen. Bred in NZ. New stock arriving beginning of May, 2019. Pre-order now. Estimated price $34.99 each. Payment when stock arrives. Hybrid. The deliciously creamy flowers of this Camellia look good enough to eat with your pudding! Vigorous and profuse flowering from early autumn through to spring. Very showy, and well worth planting. Happiest in morning sun or semi-shade. Evergreen. Japonica. This beautiful Camellia has large white formal double blooms that simply smother the bush from winter through to the end of spring. Quite a sight in full bloom. Vigorous growth habit. Happiest in semi-shade where the blooms will really shine through. Evergreen. This Camellia is named after the breeder, Kosaku Sawada, a Japanese-American who owned a nursery called 'Overlook' in the early 1900's. He was highly respected and earned the name he was commonly known by -'Mr Camellia'. Japonica. Precisely arranged formal blooms of soft rose red that are medium in size with slightly cupped petals. Very striking. Flowers from winter through to spring. Vigorous compact growth habit. Happiest in semi-shade with acid soil. Evergreen. Current Stock Height: 60/70cm ? Japonica. A delightful Camellia with miniature, formal, double white luminous blooms that are touched with pink on the edges. Very sweet and very free flowering in spring. Perfect for a pot. Happiest in semi-shade. Evergreen. Hybrid. Simple but sweet single rose-pink blooms with prominent yellow stamens are borne in profusion along attractively arching branches. The blooms are very fragrant blooms and appear autumn to winter. Small rounded bright green leaves. Happiest in semi-shade with acid soil. Evergreen. 'Koto no Kaori' translates to 'Perfume of the Ancient Capital'. Presented here as an Espalier for walls and fences. Current Stock Height: STD-80/HGT-140cm ? Japonica. Here's a showy Camellia that will stand out in the winter garden. Large bright red 'peony' blooms put on a beautiful display and sit well against the dark green foliage. Happiest in morning sun or semi-shade in acid soil. Evergreen. Japonica. Large glowing red blooms that are full, fancy and fragrant. The blooms appear from winter to spring and sit against lush green foliage. Plant in semi-shade in acid soil for best results. Evergreen. Current Stock Height: 55/85 cm ? Hybrid. Produced by and named after NZ's famous plant breeder Les Jury. Les Jury considered this to be the best formal double red Camellia that he produced in his lifetime. Very vigorous upright growth habit, handsome foliage. Happiest in morning sun or semi-shade. Evergreen. RHS AGM. Hybrid Espalier. Produced by and named after NZ's famous plant breeder Les Jury. Les Jury considered this to be the best formal double red Camellia that he produced in his lifetime. Very vigorous upright growth habit, handsome foliage. Happiest in morning sun or semi-shade. Evergreen. RHS AGM. Hybrid Miniature. A really special little Camellia that is aptly named. The miniature single flowers are pure white with just a hint of yellow on the central anthers. The flowers appear from early spring and look very dainty set against the dark green foliage. The growth habit is slow and low. Evergreen. 'Little Gem' would be perfect for a low hedge in a semi-shaded position or equally as nice as a feature in a container. Current Stock Height: 15/30cm ? Reticulata. This stunning Camellia is very well named. The huge, soft pink, formal, double flowers decorate the robust growing shrub and will make a statement in any garden. Use as a feature accent plant and allow the space to let it shine. Happiest in semi-shade, evergreen. Species. This Camellia has tiny single white blooms that carry a strong fragrance. The foliage is proportionally small in tones of green and bronze. Slightly open growth. Plant to take advantage of the perfume. Happiest in semi-shade with acid soil. Evergreen. Current Stock Height: 170/180cm ? Japonica. Not sure how this Camellia got it's name as the pure white anemone blooms are quite small and dainty. One to ponder as you admire the flowers that appear from mid winter to spring. Good upright growth habit. Happiest in semi-shade with acid soil. Evergreen. Current Stock Height: 35/55cm ? Japonica. A very showy Camellia with striking peony type blooms. The creamy white petals are all edged lightly in rose pink. Quite outstanding in full bloom from mid winter through to mid spring. Good strong grower. Happiest in part shade. Multi Award Winner. Evergreen. Current Stock Height: 75/100 cm ? Current Stock Height: 10/20 cm ? Japonica. This Camellia has large, wine-red semi-double lose blooms with golden stamens and narrow petals. Quite unusual. The flowers last well so make for an excellent garden display. Vigorous upright growth habit. Happiest in semi-shade with acid soil. Evergreen. Japonica. One of Harry's favourites 'cause most blokes love the strong maroon red colour of the showy large blooms. These are offset beautifully with distinctive golden stamens. A vigorous, upright plant that looks stunning in full bloom. Happiest in semi-shade. Evergreen. Species. The term 'microphylla' means small leaves which exactly describes the foliage of this special Camellia. Fragrant, tiny, star-shaped, single white flowers with yellow stamens. Dense shrubby habit, suitable for hedging or border planting. Happiest in semi-shade and acid soil. Evergreen. This species Camellia is one of the first Camellias to flower in the autumn. I first saw it in a friend's garden and knew it was a 'must have'. I enjoy it more every year as it is so rewarding yet easy to grow. Looks good even when not in flower. Species Std. The term 'microphylla' means small leaves which exactly describes the foliage of this special Camellia. Fragrant, tiny, star-shaped, single white flowers with yellow stamens. Dense shrubby habit, suitable for hedging or border planting. Happiest in semi-shade and acid soil. Evergreen. Japonica. Do you want to see red? If so then this delicious Camellia is the one for you. Black-red buds open to crimson, large, semi-double blooms with gorgeous golden stamens. Glossy dark foliage. Happiest in semi-shade in the garden or a favourite container. Evergreen. Hybrid. This Felix Jury Hybrid has pretty, pastel pink, perfectly formal blooms with cream tones in centre. Blooms from autumn to winter. Neat and tidy habit. Plant in semi-shade with acid soil for best results. Evergreen. Sasanqua. The literal translation from the Japanese is "Snow on the Ridge" which describes the profusion of double white blooms that smother this Camellia from early autumn until winter. Highly adaptable, use to espalier, hedge, grow in a container or simply just enjoy in the garden. Evergreen. RHS AGM. Sasanqua Standard. The literal translation from the Japanese is "Snow on the Ridge" which describes the profusion of double white blooms that smother this Camellia from early autumn until winter. Highly adaptable, presented here as a standard. Prefers semi-shade. RHS AGM. Evergreen. Species. Well the name says it all really doesn't it? This special Camellia has masses of tiny little white flowers that open from red buds. The flowers are delightfully fragrant. The new foliage is bronze toned and quite elongated turning green as it matures. Plant in semi shade in acid soil. Evergreen. Hybrid. Really lovely large semi-double blooms open from fat buds, winter-spring. The blooms have a slightly ruffled look and are highlighted by golden stamens. Handsome foliage and a nice compact habit. Plant in a semi-shaded spot in the garden or perhaps a container? Evergreen. Current Stock Height: 40/50cm ? Hybrid. This much loved has beautiful, palest pink, semi-double blooms with golden anthers that are of a high quality and hold well. Starts flowering late autumn and carries on through to mid spring. Happiest in semi-shade. Bred in NZ by Mrs Durrant. Evergreen. Hybrid. Wairere's favourite Camellia. 'Night Rider' has waxy, black-red, small, semi-double flowers complemented by black-red new foliage growth. Ideal for the smaller garden. Flowers from late winter through to the end of spring. Happiest in semi-shade. It's a 10. Evergreen. Hybrid Std. This is Wairere's favourite Camellia. Waxy, dark black red, small semi-double flowers complemented by black red new foliage growth. Ideal for the smaller garden. Flowers from late winter through to the end of spring. Happiest in semi-shade with acid soil. Evergreen. Current Stock Height: STD-80/HGT-120cm ? Japonica. Beautiful, perfect double-pink flowers. Although not scented, these flowers are a pure joy to see them unfold in late winter to early spring. Upright or slightly spreading habit with lush, leathery, dark-greenleaves. Plant in a sheltered location, away from morning sun in humous-rich, acidic soil. Evergreen. Japonica. A multi-award winning Camellia which is often described as simply perfect. The pure white blooms have petals arranged in an elegant formal spiral set beautifully against dark green foliage. Flowers in winter, upright compact habit. Best planted in semi-shade with acid soil. Evergreen. Japonica. Bred in California at the famous Nuccio's nursery this unusual Camellia has white flowers that are flushed irregularly with orchid pink. Large showy blooms from winter to spring. Bushy compact habit. Happiest in morning sun or semi-shade and acid soil. Evergreen. Japonica. A chance seedling introduced by Nuccio's Nursery in California. Exquisite formal, double blooms that are crisp white and blushed gently with pink. Flowers from winter through to spring and is a vigorous compact grower. Happiest in semi-shade with acid soil. Evergreen. Japonica. Upright evergreen of medium growth. Flowers medium to large semi-double, anemone or peony form, blush pink. Central cluster of stamens mixed with petaloids sometimes becomes a full rosette. A slight scent can be detected by some people. Height 3m. Hybrid Minature. A very sweet Camellia with small baby pink ruffled flowers that are borne on gently cascading branches. The foliage is dainty and a light olive green in colour. Ideal container plant. Happiest in semi-shade. Evergreen. This Camellia was bred in Australia in 1986 by Sebire and has gained world-wide popularity due to its top performance. Hybrid Miniature Espalier. A very sweet Camellia with small baby pink ruffled flowers that are borne on gently cascading branches. The foliage is dainty and a light olive green in colour. Ideal container plant. Happiest in semi-shade. Evergreen. New stock arriving shortly. Pre-order now. Estimated price $149.99 each. Payment when stock arrives. Hybrid Minature. A very sweet Camellia with small, baby pink, ruffled flowers that are borne on gently cascading branches. The foliage is dainty and a light olive green in colour. Ideal container plant. Presented here as a Standard. Happiest in semi-shade. Evergreen. Sasanqua. This is a really good looking Camellia with fine narrow dark green foliage that looks good all year round. In very early autumn the bush is covered in tight buds that open to pretty semi-double flowers that are white blushed with rose pink on the edges. Will tolerate sun or shade. Evergreen. PVR CML013. This Camellia is a great screen or hedging plant. Clips well and always looks good. Remarkably tolerant but will do best in semi-shade with nicely mulched roots. I have 2 of these on different sides of the property and both flower extremely well. Current Stock Height: 70/130 cm ? Sasanqua. An elegant free-flowering variety producing masses of brilliant pink buds, which open to dazzling white double blooms. Quick growing, ideal for hedging, topiary, containers or as a garden specimen. More tolerant of full sun than many other Camellias. PVR. Evergreen. Sasanqua. Paradise Hilda is a tall variety growing to a height of about 3metres with a vigorous habit making them ideal for a hedge or a screen. A beautiful way to fill the autumn garden with flowers. Produces medium-size mid pink flowers in the form of an open peony. Hilda flowers early in the season and continues flowering for a long time. Quick growing variety. Current Stock Height: 45/60 cm ? Sasanqua. Little and lovely this Camellia has small leaves and masses of tiny informal white flowers that are flushed pink. Especially suited for low hedges or container planting. Happiest in morning sun or semi-shade. Evergreen. PVR. Sasanqua. Flowers in absolute profusion over a long period. The blooms are quite large, semi-double and open white from pink buds. Upright compact growth habit. A terrific hedge plant or garden specimen. Happiest in morning sun or semi-shade. Evergreen. Sasanqua. One of the new breed of Paradise Camellias that are vigorous growers, long flowering and tolerant of tough conditions. Large, white, semi-double blooms with a little flush of pink will appear from autumn through winter. Can tolerate more sun than many but happiest in semi-shade. Evergreen. PVR. Sasanqua. This Camellia has been around for awhile but with very good reason. It is a vigorous hardy cultivar which flowers profusely with bright, cheerful, large, saucer shaped single blooms. A perfect choice for screens and hedging. Nice dark green foliage. Evergreen. Current Stock Height: 70/110 cm ? Sasanqua. A lovely little Camellia with, scented, semi-double blooms. The buds are quite pink but magically open to silky white blooms with just a hint of pink on the edges. 'Pure Silk' has a strong upright growth habit and whilst it is happy in semi-shade this Camellia can cope with sun. Evergreen. Current Stock Height: 130/140cm ? Hybrid. This Camellia is ideal for those of you who don't have a lot of space as it has a low growing, cascading habit. A good groundcover, this perfumed flowers are mainly white with the odd blush of pink. Looks wonderful in a container or even a hanging basket. Definitely on my must have list, flowers for months. Evergreen. Current Stock Height: 20/30cm ? Japonica. What a beautiful Camellia this is with gorgeous rich red, formal, double blooms that will really brighten up the garden in winter. Glossy green foliage with red tips on new growth. Best in semi-shade but is reasonably tolerant of heat. Quite slow growing. Evergreen. Japonica. A beautiful formal double red. The flowers contrast well against the handsome glossy green foliage. Outstanding performer which will make a strong statement either in the garden or a container. Happiest in semi-shade with acid soil. Evergreen. Species. A special little Camellia that has pale, pastel pink, single blooms that land upright after they float to the ground creating a floral carpet. The branches cascade gently. Overall a soft delicate effect. Happiest with semi-shade and acid soil. Evergreen. Species Std. A special little Camellia that has pale, pastel pink, single blooms that land upright after they float to the ground creating a floral carpet. The branches cascade gently. Overall a soft delicate effect. Happiest with semi-shade and acid soil. Evergreen. Red just doesn't get any better than this! Royal Velvet camellia produces an abundance of dark velvet red semi-double flowers in late winter through mid spring. Royal Velvet camellia is useful as an evergreen hedge or screen. It canbe "limbed up" to form an attractive, small, evergreen tree or is perfect for use as espalier. Hybrid. 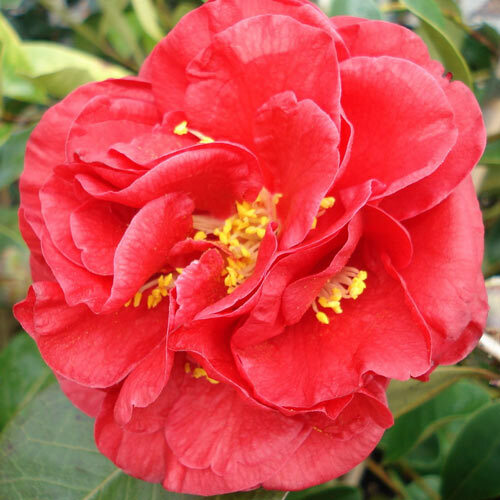 A handsome Camellia with a vigorous, dense, growth habit and show-off bright red flowers that are double, frilly and have an unusual speckled centre. Flowers in early spring. Plant in semi-shade with acid soil for best results. Evergreen. Naturally this Camellia would make a perfect gift for those who have made it to the "I've been married for 40 years" mark. Current Stock Height: 80/120 cm ? Japonica. This Camellia has medium sized blooms that are semi double in form and are a beautiful rich dark red with yellow stamens. Suits most average garden conditions though will prefer dappled light. H2m. Hybrid. An outstanding Camellia for its free flowering habit which lasts from autumn through to late spring. The miniature blooms are bright fuchsia pink with attractive white central petaloides. All of this plus fragrance as well. Happiest semi-shade with acid soil. Evergreen. Sasanqua. One of NZ's favourite Camellias and deservedly so. An abundance of large wavy white blooms with prominent yellow stamens appear in early autumn through to early winter. The blooms are softly scented. Ideal for hedging.Happiest in semi-shade. Evergreen. This beautiful Camellia is definitely one of my favourites. Introduced from Japan in 1898 so a proven winner! Translation of the name means Snow, Moon and Flowers - isn't that just lovely? Fantastic hedge plant - grows quite quickly. Current Stock Height: 90/130 cm ? Current Stock Height: 140/160cm ? Sasanqua. One of NZ's favourite Camellias and deservedly so. An abundance of large wavy white blooms with prominent yellow stamens appear in early autumn through to early winter. The blooms are softly scented. Happiest in semi-shade. Evergreen. Presented here as a Standard. This beautiful Camellia is definitely one of my favourites. Introduced from Japan in 1898 so a proven winner! Translation of the name means Snow, Moon and Flowers - isn't that just lovely? Beautiful snow white Shiro Chan has a frilly centre of white petaloids. Petals can have a pale pink sheen towards mid season. Flowers are set off against dark green foliage and Shiro Chans habit, although shrubby upright, can include horizontal or even pendulous branches. Very nice. Large blooms on a vigorous upright plant. Sasanqua. Free flowering with semi-double, rose pink blooms that appear from autumn to early winter. Very good for hedging and perfect for a pot. Apparently the name means 'Lion's Head' - not quite sure why it is called that however still well worth growing! Happiest in semi-shade. Evergreen. Shishi Gashira is a valued landscaping Camellia and has won several horticultural awards. It is very beautiful in flower but the foliage is also attractive being dark green and leathery. It can tolerate some sun but is better in dappled light. Hybrid. Desirable for the upright slender growth habit. Small, scented, single pure white flowers with golden stamens appear from autumn through to late spring. These are offset against very dark green foliage. Ideal for driveway and group planting. Happiest in semi shade. Evergreen. PVR. I have a group of these growing against a grey fence in the garden, they are remarkably tolerant of heat and sun though I am sure they would be happier in part shade. Even though the situation is less than ideal they flower for months. Hybrid Std. Desirable for the upright slender growth habit. Small, scented, single pure white flowers with golden stamens appear from autumn through to late spring. These are offset against very dark green foliage. Happiest in semi shade. Evergreen. PVR. Sasanqua. Beautiful, pure white ruffled double flowers that are of a medium size. The flowers appear in autumn and early winter. An excellent choice for hedging or espalier. Happiest in semi-shade with acid soil. Evergreen. Species. Where would we be without the 'Tea Camellia'? Well we certainly wouldn't be putting the kettle on as often. Apart from giving us tea this is a delightful ornamental shrub. Dainty glossy green leaves and even daintier single, scented white flowers with just a blush of lemon. Evergreen. Japonica. A beautiful formal double Camellia with blooms that are tones of smokey reddish purple, hard to describe but lovely to look at. Lush rich green foliage and an upright habit. Bred in NZ by Les Jury and named to honor one of our most prominent and respected nurserymen. Aluminium can enhance the colour of this camellia. Evergreen. Sir Victor Davies 1887-1977 was apprenticed to Mr Duncan, nurseryman of New Plymouth, at the age of 14. He went on to form the formidable partnership that was known as Duncan and Davies. Hybrid. The unique upright shape of this Camellia makes it ideal for marching along a driveway or using as an exclamation point in a planting scheme. Pretty pink semi double flowers from winter through to the end of spring. Happiest in semi-shade. Evergreen. RHS AGM. 'Spring Festival' has beautiful new foliage in warm bronze tones that is produced when flowering has finished. This Camellia is just lovely in full flower. I have grown it in several gardens and it has never disappointed. Standard. "Sugar and Spice" and all things nice! This plant gift has fragrant, clear pale pink flowers that will brighten up any garden at the time of the year you need it the most. This camellia will flower throughout the winter months. It grows quickly, is ideal for tubs, topiary, espalier or is perfect for those special corners of the garden. Current Stock Height: STD-90/130cm ? Hybrid. A gorgeous NZ Bred Camellia with fragrant blooms that have warm pink outer petals and numerous ruffled cream petaloides in the centre. Bred by Os Blumhardt in 1984. Happiest in semi shade. Evergreen. Hybrid. Bred in NZ by Neville Haydon this Camellia is the recipient of a Breeder's Award. The formal blooms are quite a strong shade of pink and are set against dark green foliage. Happiest planted in semi-shade in acid soil. Evergreen. Japonica. A beautiful Camellia with snow white semi-double blooms that look striking set against the dark green foliage. Flowers from July through to early spring. Nice bushy habit. Plant in semi-shade in acid soil for best results. Evergreen. Hybrid Miniature. An attractive little Camellia that has beautiful, pale pink, scented flowers that are in a miniature peony form. Glossy green foliage offsets the flowers well. A slow grower with a compact habit making it ideal for container growing. Happiest in semi-shade with acid soil. Evergreen. Current Stock Height: 15/50 cm ? Current Stock Height: 20/40cm ? Hybrid. 'Sweet Jane' is indeed just that with bright pink buds open to very pretty, double, white blooms that are heavily shaded pink. Commences flowering early May and continues for several months. Sun tolerant but also happy in semi-shade. Evergreen. PVR CML007. 'Sweet Jane' is happy in the garden or a container and would be a perfect choice for an evergreen hedge with year round good looks. Hybrid. 'Sweet Jane' is indeed just that with bright pink buds open to very pretty, double, white blooms that are heavily shaded pink. Commences flowering early May and continues for several months. Sun tolerant but also happy in semi-shade. Presented here espaliered. Evergreen. PVR. Hybrid. 'Sweet Jane' is indeed just that with bright pink buds that open to very pretty, double, white blooms that are heavily shaded pink. Commences flowering early May and continues for several months. Sun tolerant. Presented here as a standard. Evergreen. PVR CML007. Japonica. Bred in NZ by well known Camellia enthusiast Neville Haydon. Magnificent rich red flowers, turning blueish as they mature. The blooms are double with a tight frilly centre and appear from early winter through to late spring. Happiest in semi- shade with acid soil. Evergreen. Current Stock Height: 50/80 cm ? Hybrid. A very showy Camellia with large, luminous, bright pink blooms that appear from winter to spring. Dark green foliage with bronze tones on the new growth. Quite a vigorous grower, happiest in semi-shade and acid soil. Evergreen. Hybrid Miniature. Delicate pale pink blooms with white shadings smother graceful grey green foliage from winter through to the end of spring. The flowers are semi-double and miniature. In bloom the whole effect is very pretty and soft. Happiest in semi-shade but will tolerate some sun. Evergreen. 'Tom Knudsen' is an evergreen shrub of compact habit, with dark foliage and peony-form double, deep red flowers in late winter and early spring. Strong upright growth. Species. A very pretty Camellia with dainty leaves and a graceful upright habit. The white flowers open from tight pink buds and have a pleasant fragrance. Ideal for screening or hedges, very popular and deservedly so. Happiest in semi-shade with acid soil. Evergreen. Est.10yr.growth. Current Stock Height: 140/170cm ? Current Stock Height: 120/130 cm ? Hybrid. Bred from the popular species C. Transnokoensis, 'Transtasman' has masses of tiny, single flowers that open from tight pink buds. The flowers have tones of pale pink to white. Useful for upright columnar habit. Happiest in semi-shade. Evergreen. This is a top performing Camellia which seems to flower for months. Absolutely beautiful in bud - one of my very favourites. Current Stock Height: 60/80cm ? Species. Once you have planted this delightful dainty Camellia you will be enchanted. The small, single, fragrant flowers are complemented by graceful arching foliage. The new spring growth is a soft mahogany bronze slowly turning green. One for the collector. Happiest in semi-shade. Evergreen. Reticulata Hybrid. This is an outstanding, award-winning hybrid that has very large salmon pink double flowers that appear from mid winter through to mid spring. Very attractive and a strong grower. Happiest planted in semi-shade. Evergreen. For a table decoration with a difference try floating the beautiful blooms of 'Valentine Day' in a low bowl when you're having that romantic candle lit dinner. Japonica. Something just a little different - this Camellia has ruffled flowers with a distinct violet tinge when planted in the ground. This may appear more purple depending on the soil type. Aluminium in the soil will enhance the colour. Flowers from winter through to spring. Happiest semi-shade. Evergreen. Japonica. The ruffled, intense red blooms of this gorgeous Camellia will add an explosion of colour to your garden and brighten up dull winter days. Flowers for months and is a good strong grower. Happiest in semi-shade with acid soil. Evergreen. Japonica. Bred in NZ by Mark Jury to celebrate the 'Year of the Volunteer' this beautiful Camellia certainly a cause for celebration. Large, fully double anemone form, ruffled blooms open to shades of soft pink delicately edged in white and gradually deepen in tone throughout the long flowering season. Evergreen. Late flowers will have less or none of the white edging. Hybrid. The deep pink flowers of this lovely Camellia are very formal and double. Strong upright grower with masses of blooms from July through to September. The blooms can be enjoyed indoors by floating gracefully in a bowl. Happiest in semi-shade with acid soil. Evergreen. Japonica. A beautiful Camellia with perfectly formed, formal, double blooms in warm pink. Lustrous glossy dark green foliage and a neat and tidy habit completes the picture. Flowers autumn-early spring. Highly rated. Happiest in semi-shade with acid soil. Evergreen. Hybrid. An exceptionally graceful Camellia with myriads of dainty white, fragrant flowers on pendulous branches. Sensational in a container or trained against a wall or fence. Happiest in semi-shade with acid soil. Evergreen. PVR. Hybrid. This dainty little Camellia can flower for up to six months! Exceptional. The small single blooms are pale white delicately edged with pink. Strong slender upright growth habit. Happiest in semi-shade with acid soil. Evergreen. 'Yuletide' can be grown in morning sun or part shade.